You get Pocahontas Riverbend Adventure. Tested And Working. Overall fair condition. All accessories/shoes/apparels contain no foul order unless noted. All accessories/shoes/apparels should be cleaned/washed first to your ideal condition before use. THE GREAT COUNTING CAPER WITH THE THREE BLIND MICE. SCHOLASTIC'S THE MAGIC SCHOOL BUS. DISNEY THE LION KING ADVENTURES AT PRIDE ROCK. You get The Muppets on the Go. 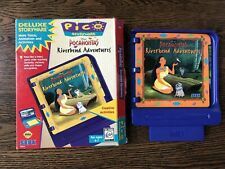 Sega Pico Storyware Pocahontas Riverbend Adventures. Box shows a lot of wear. Pages still in good condition. - see pictures. SEGA Pico Sonic The Hedgehog's Gameworld Brand New. Condition is Brand New. Box shows signs of minor wear due to age and improper storage. Seals have not been broken and item is still brand new. Sold As-Is No Refunds, No Returns Thanks for viewing! We are the original owners. 1995 Sanou Kaihatsu Series 2 Suuryou - Keisan (左脳開発シリーズ2 数量・計算) -Only one with no manual in box. 1993 Mickey no Yukai na Bouken (ミッキーのゆかいなぼうけん). View pictures for condition (NICE!). Released in Japan in 1993. Original owners. Two of my three kids used this system. (The youngest was all about PC's. ). We want you to be happy and back for more! Pepe's Puzzles for the Sega Pico Video Game System Rare Unopened. Condition is Brand New. No refunds no returns Thanks for viewing! Very good condition, tested works fine. This is another rare title for the short-lived Sega Pico game system. Smart Alex and Smart Alice: Curious Kids is a multi-game edutainment title for the Sega Pico from the mid-90s. This is probably the second best title for the system, as it contained a fair bit of decent and varied content. The game comes with the original box and manual. The box has had the UPC cut out for the mail in rebate (way before it could be done on the internet), but other than that, everything is in great shape. Please feel free to ask if you have any questions, and thanks for looking. What is complete differs from one person to another. card for the status. Master System - Region free. An industry-grade machine is used in resurfacing/polishing discs if needed. A disc is resurfaced/cleaned to alleviate scratch marks & give a polished shine. Sega Pico Storyware & Deluxe StorywareUntested! Sold as is! A Year at Pooh corner. Math & antic with Disney 101 Dalmatians. Magic Crayon. For Any Error Or Omission. I Often Take Multiple Photos To Show Item Being Described. SEGA PICO Console System Bundle with 1 Game - A Year At Pooh Corner in gently pre-owned condition with minimal wear, and minor flaws. Pocahontas Riverbend Adventures. Magic Crayons. Musical Zoo. A Year at Pooh Corner.